The Battlegrounds and PvP Panel, moderated by Olihin. 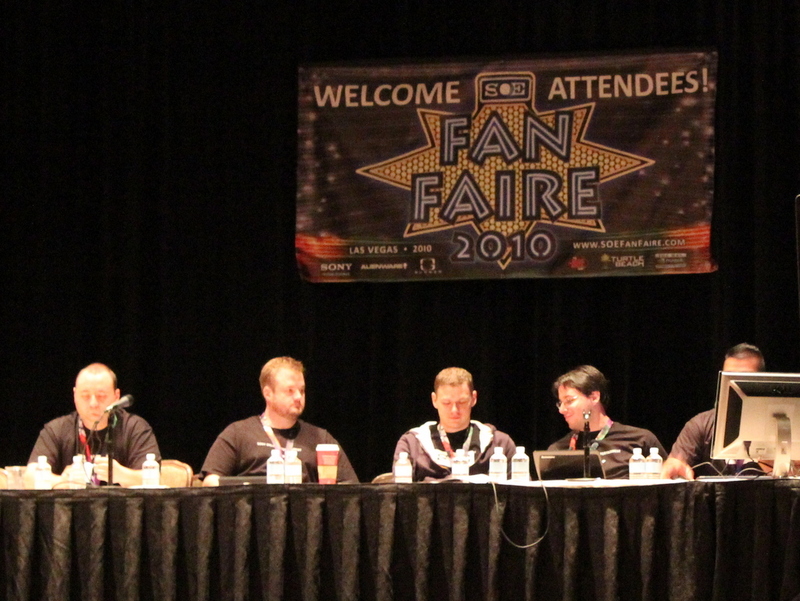 Nandy “Zoltaroth” Szots, Greg “Rothgar” Spence, Paul “Frizznik” Carrico, Mike “Xelgad” Ganz, Juan “Olihin” Cardenas. Improve matchmaker — no healer, too many tanks etc. Devs are testing all this and participating in battlegrounds and nagafen. On test: new slacker code. Even if you don’t vote afk they will eventually get a warning. Battlegrounds now available at 30-50. Perfect your skills on a new alt. 30-39 is very active. Short queues. Discord tokens are usable and heirloom. Possible removal of pvp restriction from marketplace transfer tokens. Modify toughness to be balanced. Full set of toughness is OP. Talked to a lot of players on forums and here at fan faire. A: we have been working with art team to make this more difficult. As for special abilities like blink look at the pvp description of the spells. Some of these reports are legitimate pvp actions. Q: Ganak people can grab flag and keep it a long time. Can a ramp be added? A: art team has finished this so will be out there soon. Q: ladder board and queue up for ranked matches? A: we want to add this when we have time. It has already been discussed quite a bit. Q: when mentored down on nagafen to do quests, I am defenseless. I should be able to kill them. A: we are looking into this. It will take some coding changes. Q: Can I trade up tier 1 to tier 2 bg gear? A: we have talked about this. To some people we should be able to trade. For others the blue slot adornment is enough of an upgrade to be worth it. Q: gnomish jump boots + assassin shadow step. Or fae or lon cloaks. A: if we put you in combat right away is would be pretty negative. Q: can we out a time limit on holding the flag? A: we play this game too and look at all these type of issues. Lot of changes on test. A: no announcements just now. Main priority is making sure existing 3 zones of BGs are exploit free and lag free. Q: daily quests give tokens? A: we want to put something rewarding besides just gold. Daily quests were supposed to be rewarding. Enough to funnel more players into the “daily” zone. Q: full toughness gear defiler. Can stand there all day except nagafen but can’t kill anything. A: toughness needs to be evaluated. Q: guild chat is broken by battlegrounds. A: we definitely want to make going to battlegrounds so disruptive to chats. Q: can we filter combat window? Q: 80% run speed is still an issue. A: we are discussing this. We don’t want to cripple people who can run in combat. Q: open world pvp and flying mounts. A: I want to make sure I get enough information about this and put together before we decide what to do about flying mounts so they don’t completely disrupt pvp. Q: can we get more tokens from longer battlegrounds zones? A: rewards should be based on time. We missed the mark here. Q: can runspeed be set to zero in combat? A: we have to consider the ramifications before we strip all runspeed. This would affect folks wanting to leave cities and guild halls and out in the world. Q: elect raid leaders on x2 and x4 battlegrounds? A: harder to fix than we thought. Q: on pve in a raid encounter if you back up you go full speed. On pvp in a pve situation, backwards runspeed is still slow. A: that’s on my suggestions list. Q: can we invite players from different servers to do a predefined battlegrounds hubs. A: we’d like to add a battlegrounds hub, form battlegrounds groups, chat, etc. This would also help with all the transfers back and forth. Q: grey griefers that start combat wi someone 10+ levels and then run away. A: we have some ideas. Reward players for killing ppl their one level. Q: war fields announcements don’t mention whether it’s Antonica 1,2, or 3. A: if one person is holding a zone open it’s tricky. We want to polish this and solve this..
A: not aware of this. Q: brawler peel + feign death? A: this is a tactic. Each class has tricks like this. No plans to change. Q: move chars from pve to pvp? A: we are considering removing the restrictions. Q: new players trying battlegrounds getting one shotted. A: get your friend a set of master crafted to get some toughness and then work with him. Q: can Templar reactives tick the full heal to equal the power of wardens? A: this is something we can discuss. Can a merchant be added to exchange the reward tokens I tried to do battlegrounds and can’t get anything but gears so I have tons of those rewards but none of the others and myself being from a PvE server battlegrounds is the only way for me to earn tokens. I really wanna be able to get a set of BG gear but has proven near impossible.